Historically we’ve always looked for ways to evolve how we use our money. We’ve been transacting for thousands of years and we’re getting savvier on how to enable consumers to transact with greater ease. Clearly mobile payments are becoming bigger. 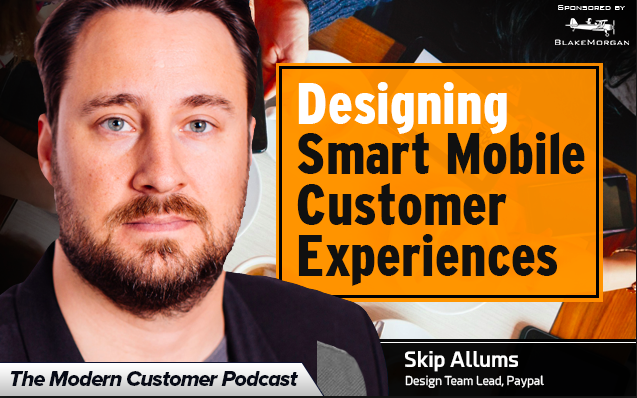 Skip Allums, Lead Designer at Paypal and today’s guest on The Modern Customer Podcast, calls it a rising tide. In this podcast we address questions such as how do we make mobile payments more convenient and safe? Consumers are increasingly wary of their financial privacy and interested in how their data is being used. Designers need to think about the customer journey and how we’re mapping the experience of the customer from the absolute beginning. Some companies are moving quickly with mobile payments. For example in Q1 of 216 the money consumers loaded on their Starbucks cards and app surged to $1.2 billion, up 22% since the third quarter last year, according to Starbucks’ filings. Apple Pay, Android Pay and Samsung Pay are all leading the charge today but it’s only the beginning. Mass adoption of mobile pay hasn’t happened yet but Allums believes it will happen in the near future.